This is a new service, subject to ongoing development – your feedback will help us to improve it. ‘Signposting’ is the medical term for providing free, valid information, regarding available services and options and pointing out the right ‘road’…. Snorer.me Signposting™ is designed to connect you more directly with the most appropriate source of help or advice to stop your snoring. 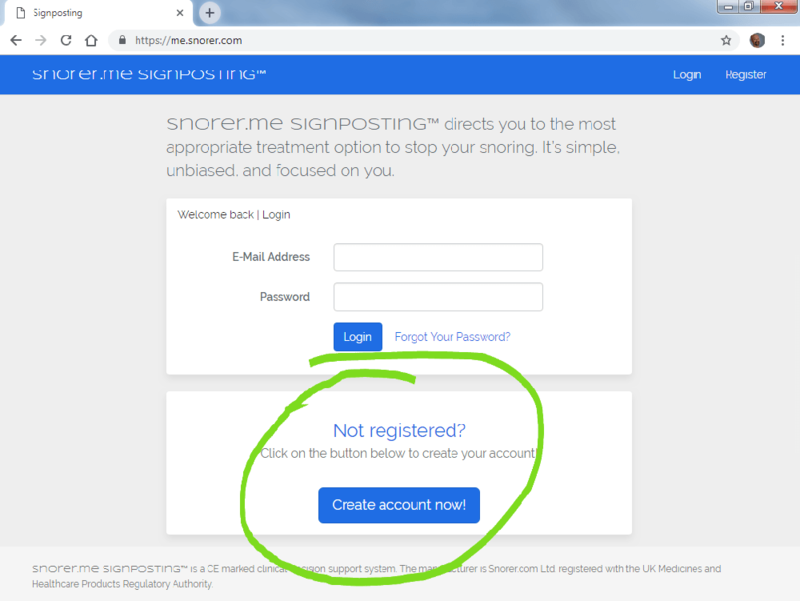 Here’s a step-by-step Guide to using Snorer.me Signposting™↗ together with an FAQ. Who can use Snorer.me Signposting? How does Snorer.me Signposting™ work? Does this replace consulting my GP? Who provides and maintains Snorer.me? Thanks for your interest in Snorer.me Signposting™. Go to Snorer.me ↗ and click the blue ‘Create account now‘ button to get started. Enter your name, email address and create a password. We’ll send you an email. Click the link it contains to verify your account. (Check spam/bin folders too). And taken the first step on the path to no longer snoring. Look up your address (or type it in). We need this to show you the nearest help. We don’t share it. 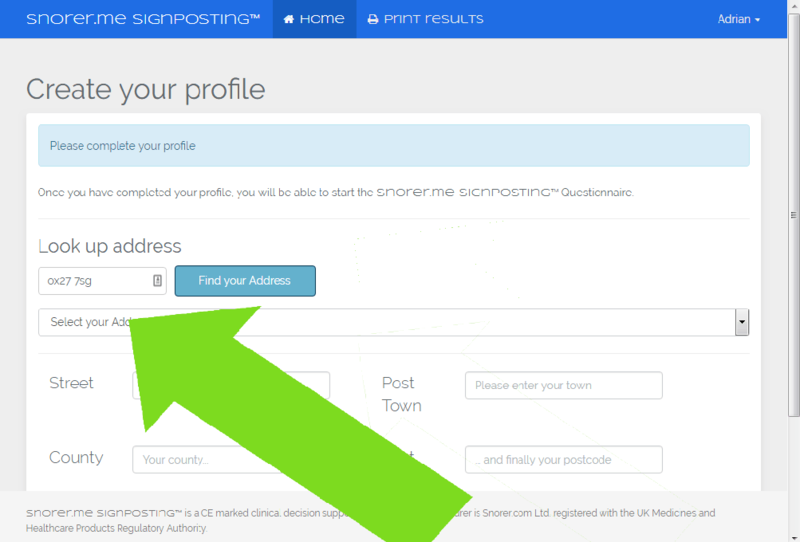 Select your specific address from the drop-down and it will automatically complete the other form fields. If you’re over 18 and in the UK – then you’re about to begin the journey to quiet restful sleep. The first of 3 series of questions. Note the progress bar at the top of the page. The second series of questions. You’re getting there! Click the buttons to indicate your Yes/No answers. (i.e. your likelihood to fall asleep). 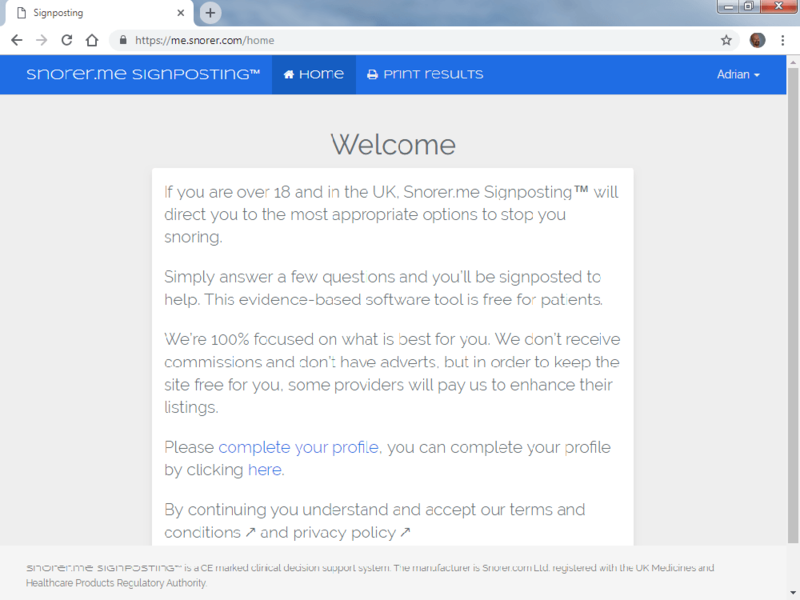 Here the snorer has been signposted to select a sleep-trained dentist (to be screened for sleep apnoea prior to being considered for) a prescription, custom-made anti-snoring device. In this example, the snorer has been signposted to their GP, with a view to further investigation (perhaps they’re sleepy as well as a snorer – or they have other health problems as well). Click ‘Print results’ to download your PDF results (top menu). It will appear in your downloads folder. The file-name is your unique identifier (used instead of your name). Frequently Asked Questions about Snorer.me Signposting™. Have a question we haven’t answered? Please get in touch. Help a healthcare professional screen you for obstructive sleep apnoea and relevant co-morbidities (by capturing your assessment data in your own time and not their clinical time). Snorer.me Signposting™ asks the questions your GP would – but this way you get more time to think about your answers. The aim is for you to obtain appropriate help more quickly and free up GPs to help more complex cases. 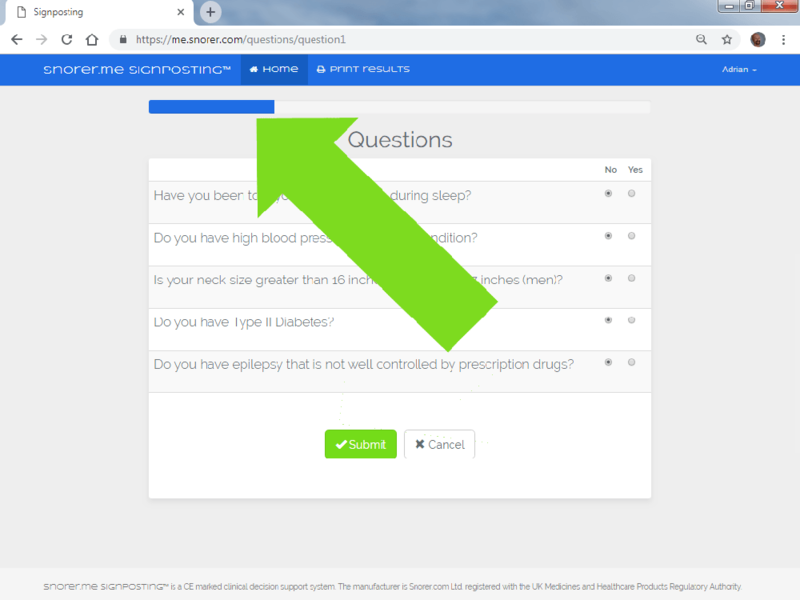 Snorer.me Signposting™ does NOT provide you with a diagnosis (neither does it screen you). Decisions (as the name ‘Clinical Decision Support System’ suggests) are made by Clinicians. Triage is by definition limited and cannot be accurate – the outcome is based upon the information you provide. …the assignment of degrees of urgency to wounds or illnesses to decide the order of treatment of a large number of patients or casualties. Which we take to mean, directing you to the most appropriate professional based upon your answers to some basic ‘red flags’ and some professionally agreed boundaries as published in a pre-treatment screening protocol1. Signposting is intended to get you in front of someone who can help you rather than move you ‘from pillar to post’ (and we believe you want that person to have the information they need to do their job). In technical terms, Snorer.me Signposting™ is a Class 1 medical device, Standalone, Clinical Decision Support System, Software as a Medical Device. The manufacturer is Snorer.com Ltd. Registered with the UK Medicines and Healthcare Products Regulatory Authority. Who can use Snorer.me Signposting™? This service is for adults (over 18) in the United Kingdom. Screening because screening is something a healthcare professional does with the information they have obtained perhaps through your use of signposting together with their face-to-face assessment. We estimate Snorer.me Signposting™ will take 10-15 mins to complete as the questions are a mixture of Yes/No responses and ‘click/tap the picture’. If you’re signposted to a sleep-trained dentist, they have a week to respond to you. If you’re signposted to your GP, print your results and contact your GP immediately. 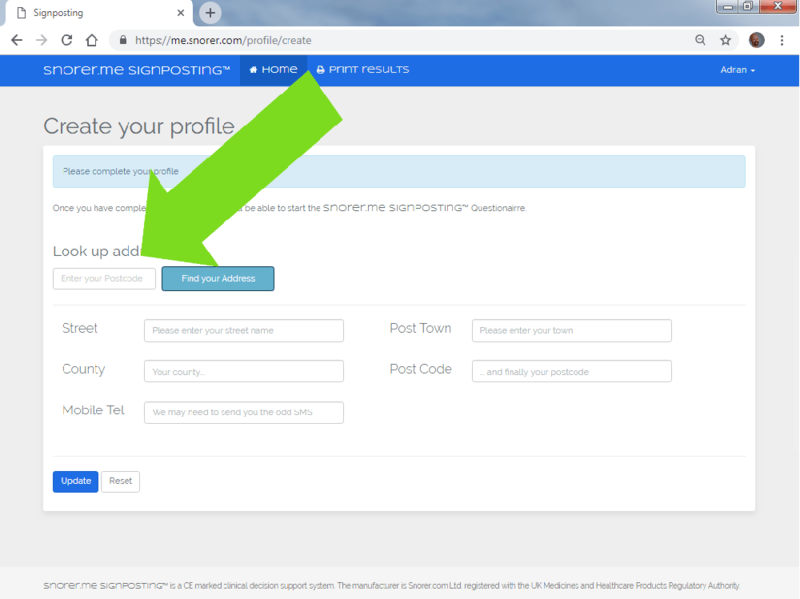 Once you are on Snorer.me you start by creating a profile. We need this information to direct you to your nearest professional. We do not share this information. Then you complete a 3 part questionnaire about your health and sleep. 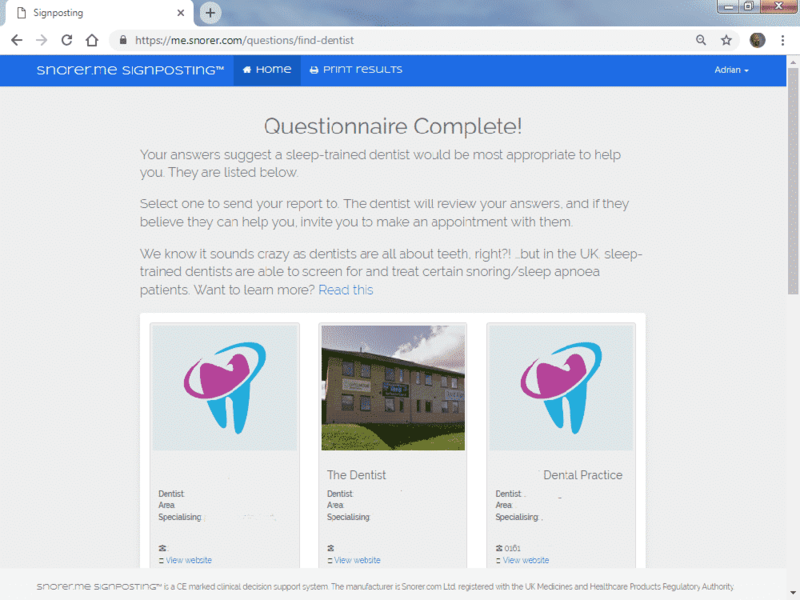 Depending upon your responses, you may be directed to select a sleep-trained dentist or to your GP (you can always print your results and consult your GP). 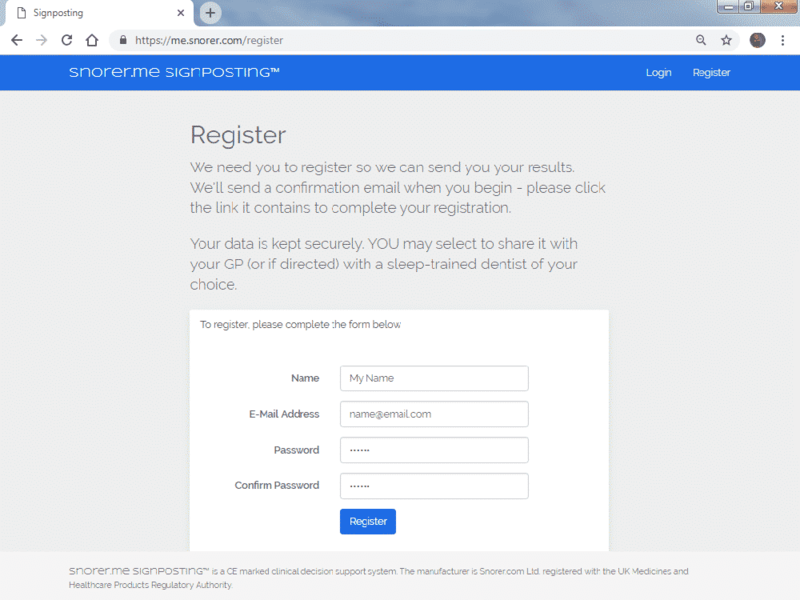 If you select a sleep-trained dentist to screen you for sleep apnoea (prior to considering you for a custom-made anti-snoring device) your questionnaire is sent electronically (in de-identified PDF format). The sleep-trained dentist then reviews this information and determines if (subject to actually seeing you!) they may be able to help you. If the dentist thinks they can help – you’ll get an email advising you to make an appointment with them in the regular way. You answer 25 questions on-line. Depending upon your answers, you will be signposted to either your GP or to select a UK sleep-trained dentist. The professional you’re signposted to, then has the information necessary to help you and determine if you need further investigation (of course subject to their face-2-face assessment). If you’re signposted to select a sleep-trained dentist, it’s because a custom-made, prescription anti-snoring device is the first way to stop snoring and you do not need to see your GP first (they have nothing to offer you for ‘benign’ anti-social snoring i.e. without sleepiness symptoms or other health issues). If you’re signposted to your GP, print your results and take them with you. You will save the GP (and yourself) considerable time. You’ve also demonstrated that you’re serious about seeking help. Custom-made anti-snoring devices are considered first-line therapy for anti-social snoring. Unlike your General Medical Practitioner, sleep-trained dentists can assess the suitability of patients for treatment with such a custom-made anti-snoring device (Mandibular Repositioning Device – MRD). Sleep-trained dentists can arrange adequate follow-up and treatment to monitor the effects of such devices on the teeth, gums (periodontal tissues) and your jaw-joints (temporo-mandibular joints – TMJs). Snorer.me Signposting™ is free for patient and GP use. In order to keep this service free, some sleep-trained dentists may opt to enhance and promote their listing. Oral appliance therapy for snoring (mandibular advancement devices) is currently a private, fee-paying dental treatment. Diagnosis and treatment of sleep apnoea is available free from the NHS for UK citizens. No. If you’re sleepy or drowsy when you should be awake, immediately consult your GP. Snorer.me Signposting™’s purpose is to provide an additional and more direct way for you to access appropriate care for anti-social, benign snoring. This service is designed to help people who may not recognise their sleep apnoea symptoms (because of the nature of sleep apnoea, the individual is not always aware they have the condition). Snorer.me Signposting™ has been developed from industry recognised, published pre-treatment screening and sleep history questionnaires, that have been in use for a decade or more. Snorer.me was created by Adrian Zacher with expert outsourced IT help. It is provided and maintained by eeZed Ltd. under licence from Snorer.com Ltd. the manufacturer registered with the UK MHRA. Snorer.me Signposting™ benefits you, your GP and the NHS. NHS sleep unit resource usage is optimised. Non-sleepy snorers without co-morbidities (e.g. not obese, not diabetic, no heart conditions etc.) are directed to sleep-trained dentists. Triage is by nature inaccurate. We urge you to consult the medical or dental professional you are directed to about your snoring and/or sleepiness symptoms. This tool is offered in good faith and includes questions from a published screening protocol1 (that is recognised by professional bodies such as the Association for Respiratory Technology and Physiology UK and professional indemnity insurers). We consider the possible theoretical risks arising from your use of Snorer.me Signposting™ are far outweighed by the benefits. However, despite our best efforts, it is always possible that we’re hacked and your data is compromised. We take electronic and physical measures to mitigate against this, including anonymising your data. In an ideal World, the patient’s own GP is the right person to help every snorer. GP’s have access to a patient’s medical history, they are the trusted ‘first-to-mind’ for the Public and they rightly control who accesses NHS secondary care. However, nobody (especially GP’s – being the caring professional) likes to feel impotent, unable to offer much assistance to those in need. Snoring is far from benign: the social consequences for the snorer (and partner) demand help. Yet, first-line therapy for benign snoring i.e. without hypersomnolence or relevant co-morbidities, is a device prescribed by a dentist. Determine the most appropriate way to help. If we accept that only snoring patients complaining of daytime sleepiness (somnolence), with a positive history of obstructive sleep apnoea are likely to be referred for specialist investigation, then snoring patients with no relevant medical history and a negative obstructive sleep apnoea (OSA) history are unlikely to be screened at a specialist level. 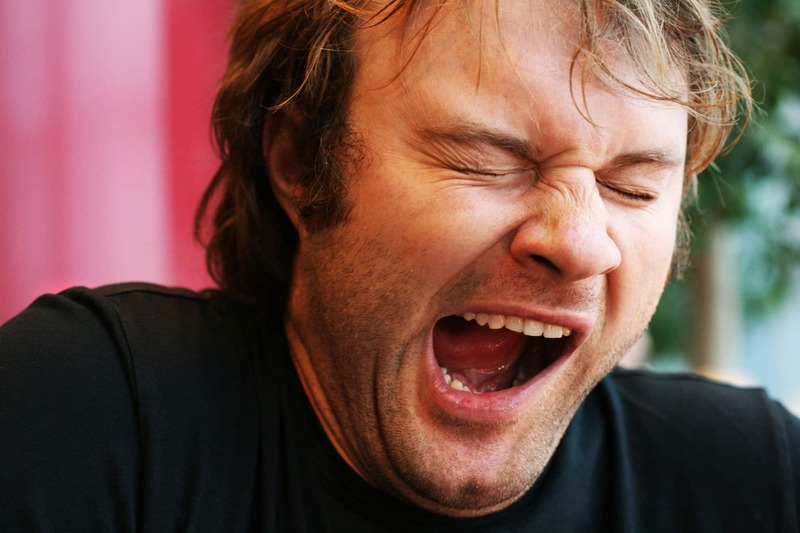 In the UK, a sleep-trained dentist can (in an indemnified way) screen and recognise obstructive sleep apnoea symptoms. As such, they are the most appropriate professional to offer first-line therapy (a custom-made anti-snoring device) to those who do not merit further investigation in secondary care. 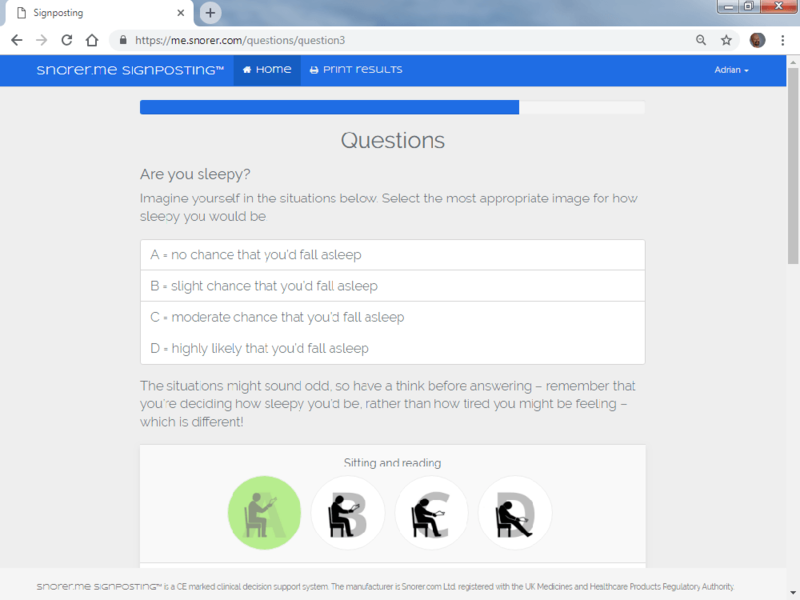 Should an individual snore, with or without experiencing sleepiness during their normal awake time then this Clinical Decision Support System which uses (amongst other questions) a pictorial version of the Epworth Sleepiness Scale1 and the published Stradling Dookun pre-treatment screening questions2 could reasonably be considered appropriate to capture the data for professionals to use and determine the necessity for further investigation in accordance with their current assessment criteria (which of course may change). Why would clinicians use a Clinical Decision Support System (CDSS)? Clinicians use a CDSS to capture patient data that enables them to screen and recognise symptoms of a condition (where they are medico-legally entitled to) in order to improve patient care, by eliminating unnecessary testing, thus enhancing patient safety and avoiding potentially dangerous and costly complications. This web based app is a standalone, CE marked medical device. 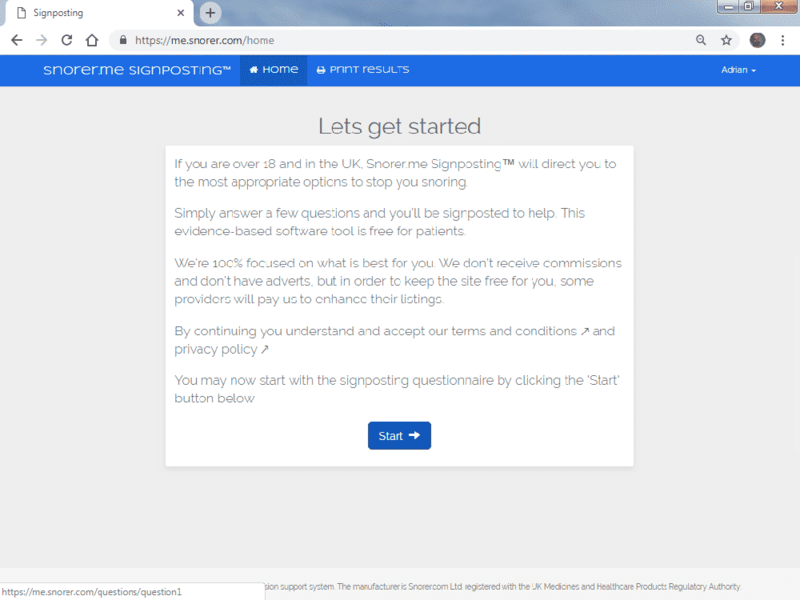 Snorer.me Signposting™ utilises (amongst other questions) the BSDSM pre-treatment screening protocol2 . The patient data collected by this app is intended to be used by a professional working to this protocol (or its evolution), which has been in use in the UK for a decade (published in the BDJ 2009). Research data to support real world effectiveness of the current BSDSM protocol has yet to be obtained. Regardless, the BSDSM protocol is considered a positive contribution to patient care and as such it is recognised by dental professional indemnity insurers, the Association of for Respiratory Technology and Physiology (UK) and it forms a part of the ARTP’s Standard of Care for MADs. Snorer.me Signposting™ is a stand alone, web-based app designed to help people manage their health by signposting them to the most appropriate professional. Unlike a General Medical Practitioner, sleep-trained dentists can assess the suitability of patients for treatment with a custom-made anti-snoring device (Mandibular Repositioning Device – MRD) and can arrange adequate follow-up treatment to monitor the effects of such devices on the teeth, periodontal tissues and temporo-mandibular joints. Custom-made Mandibular Advancement / Repositioning Devices (MADs / MRDs) are considered first-line therapy for anti-social snoring and second-line for diagnosed OSA patients. Sleep-trained dentists in the UK may screen and recognise OSA symptoms and refer the patient to a GP with a view to further investigation. Snorers the sleep-trained dentist has screened for OSA, who are not somnolent, have no OSA history or relevant co-morbidities would not normally be referred for further investigation. Consequently, a sleep-trained dentist may in defined circumstances consider offering oral appliance therapy i.e. a custom-made anti-snoring device to manage the patient’s snoring (Professional Indemnity Insurers have position statements on this activity). Are you a sleep-trained dentist in the UK? Learn more about receiving signposted patients. Snorer.me Signposting’s™ information content has been validated through our Information Standard process (we are members of NHS England’s “The Information Standard”). Initial identification, assessment and referral. This free signposting tool is supplied in good faith because we want to help: we want to get things right. Let us know your thoughts. Have we succeeded? Could things be better? 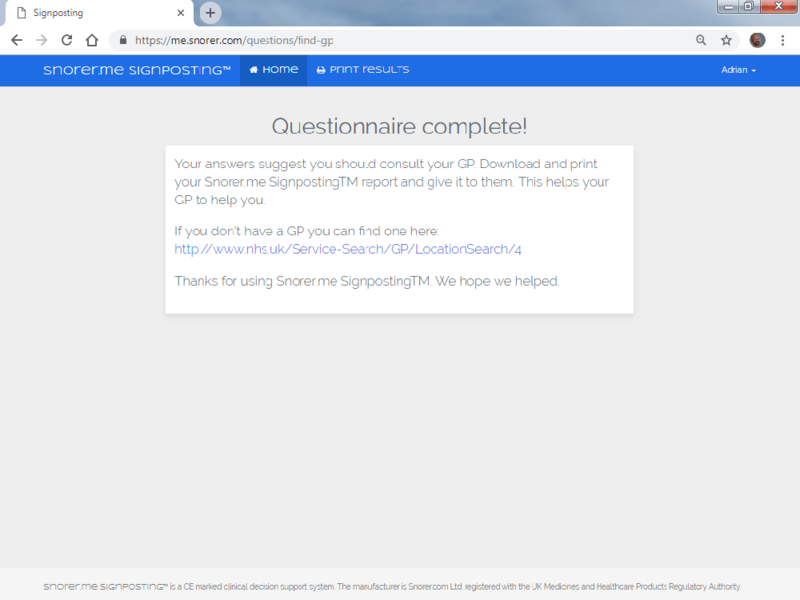 “Snorer.me Signposting™”, provides UK adult snoring patient signposting to optimise use of both GP/GDP clinical time and finite NHS secondary care sleep diagnostic services. Snorer.me Signposting™ is a free service. In order to keep it this way some dentists may opt to enhance and promote their listing. SHOULD YOU BE ADVISED NOT TO PERFORM A VIGILANCE CRITICAL ROLE BY THE DOCTOR/SLEEP-TRAINED DENTIST YOU AGREE TO DEFEND, INDEMNIFY, AND HOLD SNORER.COM LTD., ITS OFFICERS, DIRECTORS, EMPLOYEES, AGENTS, LICENSORS, AND SUPPLIERS, HARMLESS FROM AND AGAINST ANY CLAIMS, ACTIONS OR DEMANDS, LIABILITIES AND SETTLEMENTS INCLUDING WITHOUT LIMITATION, REASONABLE LEGAL AND ACCOUNTING FEES, RESULTING FROM, OR ALLEGED TO RESULT FROM, YOU FAILING TO FOLLOW THIS PROFESSIONAL MEDICAL ADVICE. Snorer.com Ltd. its subsidiaries, affiliated companies, joint venturers, business partners, licensors, employees and agents accept no responsibility or any liability for the decisions, actions or inaction by healthcare professionals you are signposted to. We will NOT use your email address and/or phone number to contact you for marketing purposes. 1. Ghiassi R, Murphy K, Cummin AR, et al Developing a pictorial Epworth Sleepiness Scale Thorax 2011;66:97-100. Snorer.me Signposting is a CE marked Clinical Decision Support System (CDSS) Software as a Medical Device (SaMD). Snorer.com Ltd. is the manufacturer registered with the UK Medicines and Healthcare Products Regulatory Authority. Copyright Snorer.com (2019) All rights reserved. Created by Adrian Zacher. Page last updated 15th April 2019.